Wound dressings for light bleeding, large surface cuts, scrapes, burns or post-surgical wounds. The ouchless non-stick pads are made of a soft, perforated Mylar film bonded to a cotton/polyester pad that is absorbent and breathable. 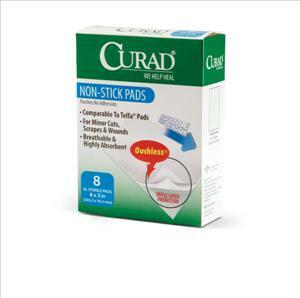 The pads can be cut or trimmed to fit most wounds and are available with or without adhesive tabs, requiring no tape to stay in place on sensitive skin. 3" x 4" without adhesive tabs.